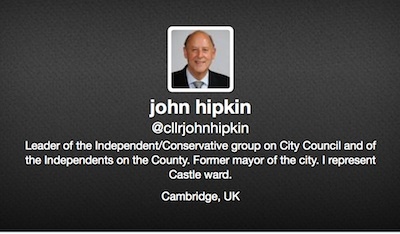 Cllr John Hipkin has sent a comment on the Castle Ward election results to an email list. I thought the content of the message was surprising and ought be made available to a wider audience so I am publishing it here. I am astonished at Cllr Hipkin drawing a sharp distinction between “residents” and “students” in his ward. Students are residents. Since the Cambridge University Parliamentary Constituency was abolished in 1950 student electors have been given equal standing to other electors. The tone suggests this is the fault of students. There is a problem with accessing students, and getting information to them. It’s not possible to just post flyers through letter boxes of students living within colleges, as they do not have publicly accessible letter boxes. This is also a problem which affects some of the city’s blocks of flats and gated communities. I have experienced even addressed bulk mail not being delivered individually to students, including poll cards; with piles of such mail being dumped in porters lodges, if accessible to the recipients at all. I would like to see students’ unions, including those within colleges, help their members cast informed votes; and provide routes for candidates to communicate with their members. I would like to see candidates approaching students’ elected representatives and trying to work together to achieve better communication. Approaches from candidates may get rebuffed of course but if the approach was made in public hopefully some students would see this and hold their own student representatives to account and make the case for co-operation. In one ward, Newnham, we did during the recent elections see a student society in Kings College running hustings for both the MEP and Cambridge City Council elections. Castle has nearly 4000 student voters out of 6500 in total. Normally only 10% of students vote in local elections compared to 50% of ‘residents’ which means that ‘residents’ have a decisive say in the outcome. On this occasion the student vote rose dramatically to something close to 25%. Students do not vote for community independents (they simply know nothing about them) so the political parties have a huge advantage in a high level poll. We are proud of what ML achieved last night by winning 50% of residents’ votes and because she overcame the ‘student factor’. Again many thanks to those of you who gave her your support , encouragement, practical help. Please pass on the result to friends and neighbours who may not have access to email or be on our distribution list. This entry was posted on May 24, 2014 by Richard Taylor. @CherryHintonBlu @RTaylorUK 6500 voters on electoral register, of which c. 4000 are students… Castle Independent did well. Richard, I often took Mr Hipkin to task for using such language. He used to refer to the ‘itinerant’ and the ‘settled’ community in NWSite meetings. My partner and I had arrived in the area as students, stayed, and brought up a family here. We are not unusual, so such divisive language is not only offensive but it is inaccurate. Students, postgrads, post-docs are all residents wanting and deserving of the same things.